I tried to use a tool of Tangotiger's called Marcel. There is a good chance I did not apply it correctly (I think I did, that is why it is updated) but I attempted to measure the skill level of the players using the last 3 years of performance with more recent years being weighted more and using a regression to the mean. Maybe in a day or two I will go through the numbers. First I tried to generate an OPS relative to the league average for the 8 position players on each team. Then I took the simple average of that. For the Yankees, it was 10.13% above the league average. For the Phillies, it was 7.54% better. If we assume a league average of .750, then the Yankees would be at .826 while the Phillies would be at .807. I did not make any park adjustments and this might hurt Ibanez for his two years in Seattle. The Yankees have a big edge in the first and second matchups while the Phillies have the edge in the 3rd one. But Fangraphs has the same league average each year for both leagues. This may not be right, and if not, it would probably mean that the Yankees have an edge in all 3 slots. Then, as I mentioned yesterday, the Yankees were much better against lefties this year than the Phillies. Jeter's skill level means his OPS is 8.46% better than average. So I did this for each player on each team. I added their relative to the league average and then divided by 8. I did something similar for the starting pitchers. Yankees vs. Phillies: Can OPS Tell Us Anything? 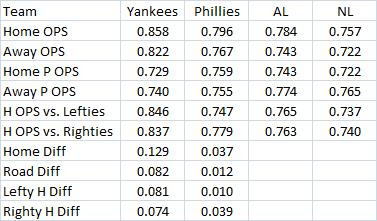 The table below shows the team OPS for both the Yankees and Phillies as well as the OPS their pitchers allowed. So the Yankees have an overall advantage of .081 in OPS. I once found that winning pct = 1.26*OPSDIFF + .5. A team with that big of an OPS differential wins about 60% of their games. So that might be the Yankees probability of winning (although it may not be that simple-I actually came up with about a 72% chance for them to win if they have a 60% of winning each game). Of course, the Phillies did not have Lee or Martinez in their rotation all year. So the differences may not be thaat great in the series and we need to take that into account. The next table shows the OPS of each pitcher in the rotation for the two teams, in what looks like will be the order for the series. Each pitcher's OPS is compared to the league average. The next table shows which pitcher has the advantage in each matchup. The Yankees have a big advantage in each of the first three games. My guess is that it will only be in game 4 that the Phillies have the advantage. Then the rotation starts up again. The Yankee hitters also had an OPS that was .076 better than the league average while the Phillies were only .042 better. The next table shows some other breakdowns. It shows both hitting and pitching OPS for both teams, home and road and also the league averages for those respective stats. The Yankees outhit their opponents at home by .129 in OPS. For the Phillies, it is only .037. On the road, these two stats are .082 and .012. So when in Yankee Stadium, the Yankees have an advantage of .117 (.129 - .012). Even in Philadelphia, the Yankees advantage is .045 (.082 - .037). My guess is that park effects are not a big deal here. 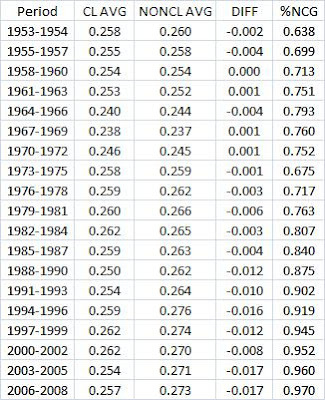 The simple average of the OPS in Yankee stadium was about 1.6% higher than in Yankee road games (I simply added what the Yankees hit and allowed at home and divided by 2, then did the same for road games and then the home number was divided by the road number-that is all probably not quite right since Yankee pitchers have more innings at home than Yankee hitters since they don't bat alot of the time at home in the bottom of the 9th). For the Phillies, this was 2.2% higher in home games. So, overall, not much going on with park effects. Also notice that the Yankees hit .081 better than the league against lefties this year and they get to face 3 lefty starters. The next table shows how the two bullpens faired compared to the league average bullpens. So even here, the Yankees have an advantage. Also, I once calculated that the team with home field advantage wins 51.52% of the time, if the two teams are of equal strength. The Yankees played in the tougher league (the AL has been winning most of the interleague games the past few years). And the other 4 teams in the AL East combined to finish 6 games over .500 outside their division this year. In the NL East, it was 28 games under. So it looks like the Yankees played in a much tougher division, too. Will Barry Larkin Get Elected To The Hall Of Fame? This is being discussed at Baseball Think Factory now. Click on Red Reporter: JinAZ: A HOF Case for Barry Larkin. I sure hope he gets elected. Sean Smith's Wins Above Replacement Rankings have him at 58th all time. Seems like a no brainer. But what do the voters like? I created two models earlier this year. One is called Predicting Who Makes The Hall Of Fame Using A Logit Model. It gives him a probability of only about 17% of making it. The model took into account career average, number of 100 RBI seasons, all-star games, PAs, MVP awards, world series performance, getting 3000 hits and being a catcher. The other model was called What Determines Vote Percentage In The First Year Of Hall Of Fame Eligibility? (Part 2). It said it would be 34.6% for Larkin. It took into account the same things as above plus getting 500 HRs, getting 500 SBs, gold gloves (but not being a catcher). I sure hope my models are wrong. But this analysis was based on what the voters did from 1990-2009. Does Jimmy Rollins Have More Pop As A Left-Handed Batter? Now for his entrire career. Now for his whole career. So, it looks like he has more power as a right-handed batter (but again, the edge is slight for his whole career). I don't think this is sabermetrics. I think it is just arithmetic. But it seems like announcer make this mistake alot when talking about lefty/righty stats. They look at raw totals instead of percentages, forgetting that there are fewer lefty pitchers than righties. The data came from Retrosheet. The graph below shows the % faced in the AL. Now for both leagues in the same graph. The AL is the red line and the NL is the blue line. 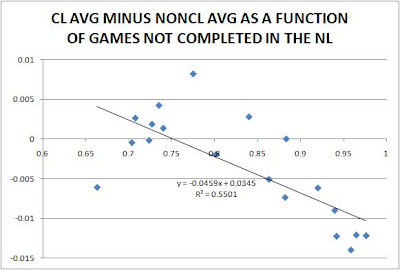 This last graph shows the difference between the two leagues (NL - AL). 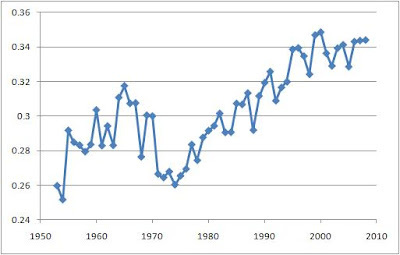 In the first year, 1953, the NL had 0.288 while the AL had 0.259 for a difference of about .029. Then the next year the NL was .04 higher. 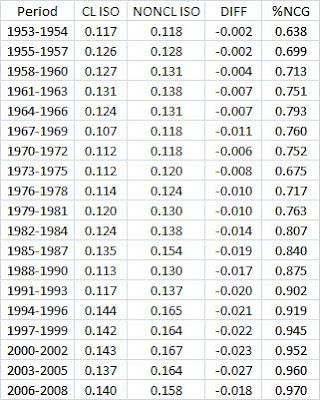 It is intersting to see that there was one trend to about 1970 of the NL edge falling (actually turning negative in 1960 and staying there until 1970, except for 1962). 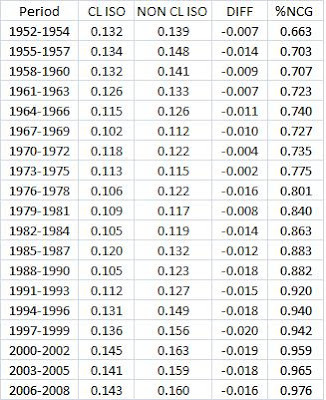 Then there is a trend for at least 10 years of the NL rising relative to the AL. 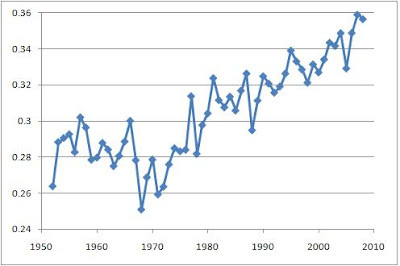 Then it generally declines until about 2000 and then it starts rising again. Maybe the DH plays some role here but it can't explain all of it. 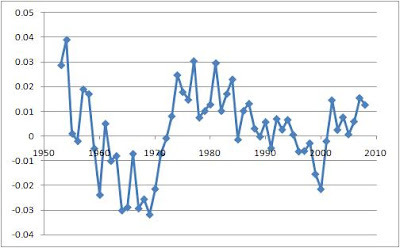 Did The Increased Use Of Relief Pitching Cause A Decline In Clutch Hitting? 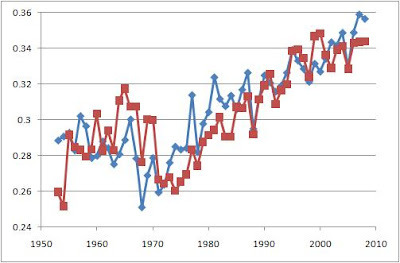 This is mainly an elaboration on last week's post called Clutch Hitting Over Time (1952-2008). 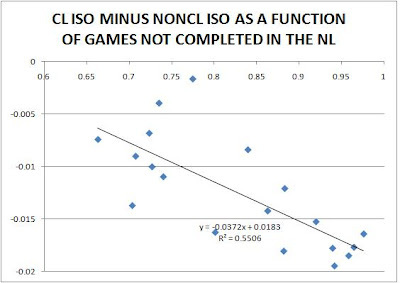 What I found was a correlation between the fall in percentage of games completed and clutch hitting (as measured by the difference between non-close and late (NCL) situations and close and late (CL) situations). Here, I just turn things around and make the measure of clutch CL - NCL (the two stats I used were AVG and isolated power or ISO). 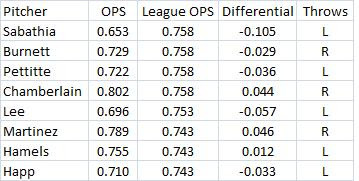 The table below shows the AL AVG in both CL and NCL for the given periods. 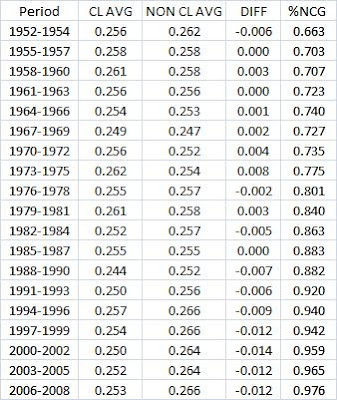 I broke things down by 3 year periods because there was alot of volatility from year to year (the Retrosheet data on this in the AL starts in 1953 and 1952 for the NL). The period averages are simple averages. The DIFF column is just the first minus the second and the last column is the percentage of games not completed. You can see that the difference has generally gotten more negative over time as the percentage of games not completed has increased (a proxy for the use of relief pitching). I was surprised to find that there were years when the AVG in CL situations was higher than in NCL situations. The next graph shows relationship between the last two columns from the table above. 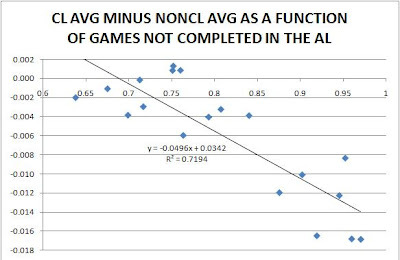 The r-squared in the graph refers to the percentage of variation in clutch hitting (CL - NCL) explained by the percentage of games not completed (%NCG). It was 71.94%. Now the same two tables for the NL. Interesting that the r-squared is so much lower in the NL. No reason comes to mind. 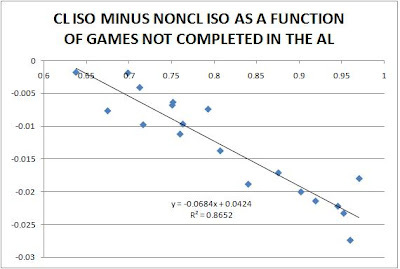 The next set of graphs does the same thing for ISO in the AL. The .8652 seems very high. 86.52% of the variation in clutch is explained by the change in games not completed. Now for the NL. Okay, he has won the triple crown covering the years 2001-2008 in the NL. Here are the top 10 in AVG, HRs, RBIs with a 2000 PA minimum. Once we extend it to 2009, he will still lead in all 3. Maybe some other hitters have done this over a 9 year stretch or longer. Hornsby did for his entire NL career! Ted Williams did it for his entire career! So did Stan Musial! Anybody know who else had a long span triple crown? I will look at obvious choices when I get a chance. Data from the Lee Sinins Complete Baseball Encyclopedia. On June 8th, I asked Should We Keep An Eye On The Rockies? It was right after they swept the Cardinals in St. Louis, scoring alot of runs in a combination of blowouts and un-close games. Given that the Cards were (and still are) a very good team, I thought the sweep was an indicator of how good the Rockies might be. But I sure got some other precictions wrong. Like Albert Pujols Has A Good Chance To Win The Triple Crown. He lead the league in HRs and RBI's on July 4th while only trailing Hanley Ramirez in average by .008 in average. I thought is better track record (including 2nd half hitting) gave him a good shot to lead in AVG over Ramirez and the other top hitters. But he may not even lead in RBIs. And then there was Is Ryan Howard The New Mickey Vernon? (Or Is His Career Really In Decline?). His offensive winning percentage(OWP) had declined the last 2 years.